I had just graduated from college and moved back home to look for a job when my sister, Megan, and I began attending our church's young adult group. Megan quickly caught the eye of a college student named Brad and they soon began dating. Being single myself, I was often the third wheel to their lovebird activities. But while Megan was away at school, Brad and I were left to fend for ourselves. The more time I spent with Brad - playing Scrabble (he never let me win), eating sushi and even camping - the more he became the little brother I never had. He took note of all my irrational fears and never missed a chance to poke fun at me. We even bickered like brother and sister. In 2003, Megan and Brad were married, and I officially gained a brother. Brad has been there for all of my adult life. He was an usher at my wedding, came to the hospital to meet both of my boys the day they were born and was by my side when my dad lost his battle with cancer. But, as the years have passed, the time we spend together seems to have dwindled to holidays and the rare family get together. Brad is quite possibly the busiest man I know, married to the busiest woman I know. There just isn't time to play Scrabble the way there was before mortgages, children and family obligations. But, that doesn't mean I don't miss those days. Brad is also the most generous person I know. It is so rare that those who have been so richly blessed bless others in the capacity that he does. My family and I have been the recipient of Brad's generosity countless times. But, the real mark of a giver is giving to strangers when you have nothing to gain. Brad's giving recently reached new heights with the fulfillment of his passion to open a local food closet. Now, he literally helps feed hundreds of families in need as the Director at the Orangevale Food Bank. I think anyone who is that dedicated to making sure other's bellies are full should be fed, too. So, Brad, grab a fork. 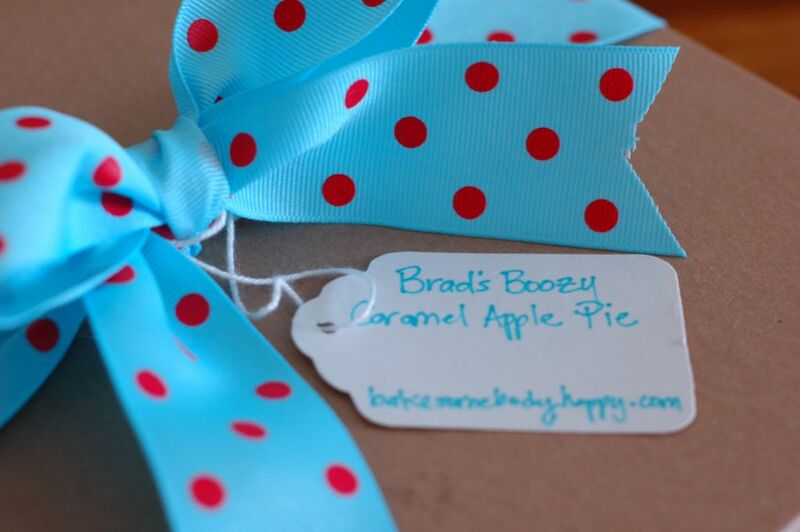 There's Boozy Caramel Apple Pie coming your way. 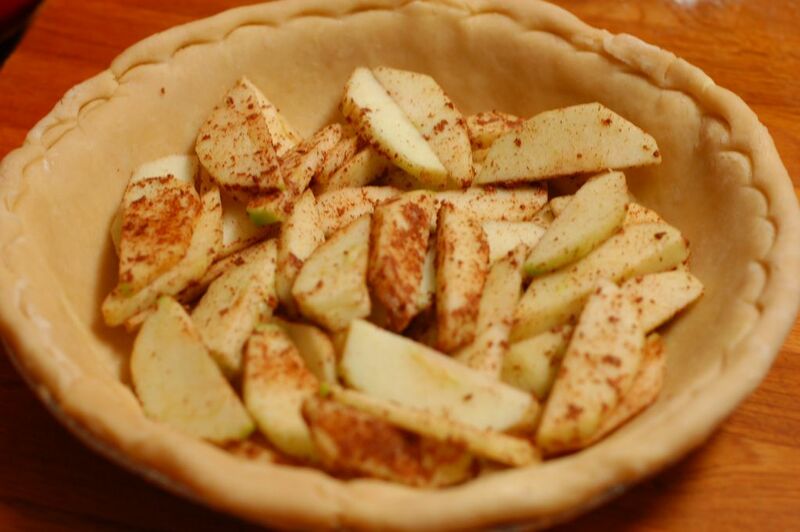 The thing that sets this pie apart from any other apple pie, or caramel apple pie for that matter, is the addition of red wine. Now, I am not a wine drinker. I couldn't tell a Cabernet from a Merlot to save my life. But, Brad sure could. Good grief - the man has his own wine cellar and tasting room in his home. And did I mention he grows his own grapes and bottles his own wine? Yep, he knows his stuff. So, red wine caramel sauce was sure to be a hit. But, I was clearly going to need some advice from a more sophisticated palette, so I picked my mom's ear about inexpensive red wine varietals. 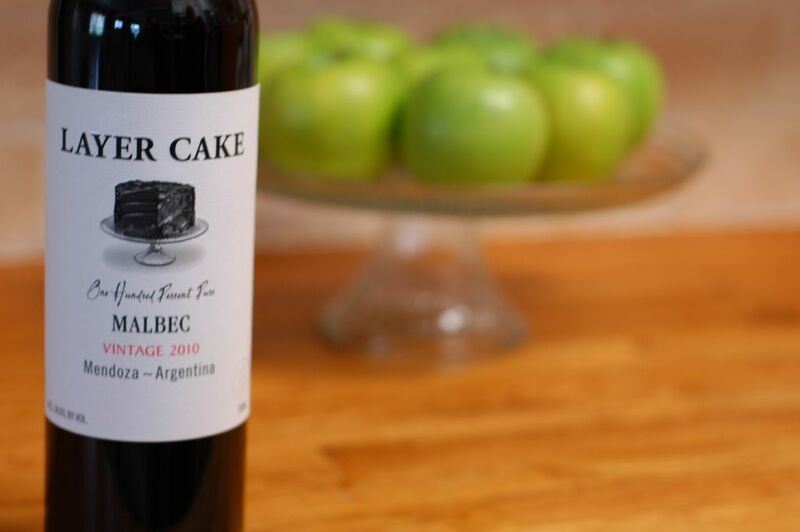 She suggested a bottle of Layer Cake. Okay, maybe I could get on board with the wine thing after all. I mean, anything named "layer cake" must be yummy, right? The lady in the wine department at Whole Foods confirmed that she thought the Malbec would be a delicious addition to a pie. And bonus points for a pretty label. Sold! 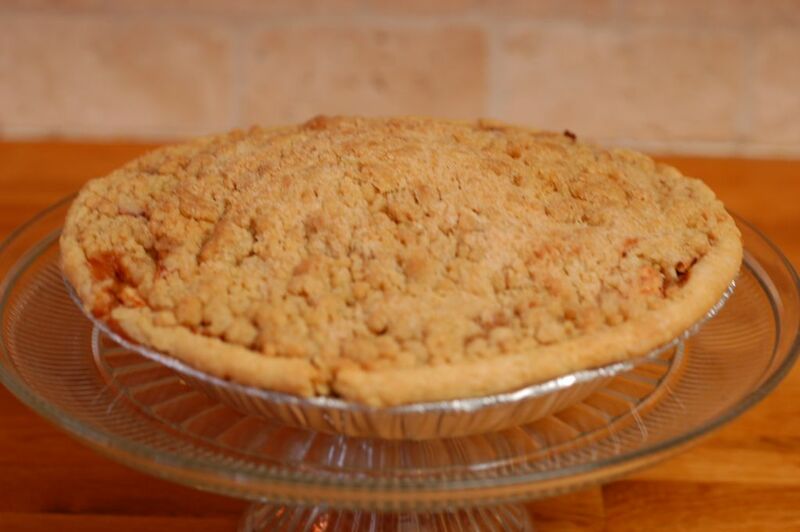 I find that a lot of my pie-related stress can be traced back to the fact that I typically begin baking at 8:00 pm, after the boys have gone to bed. 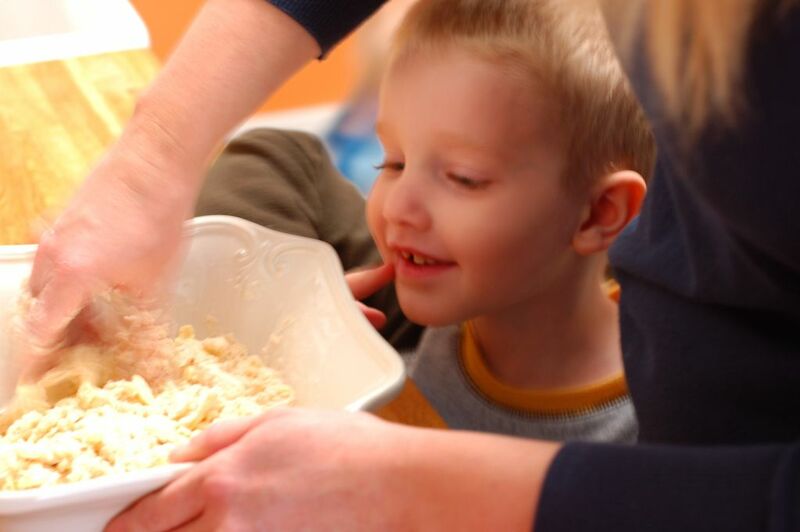 Although this schedule enables me to bake without the ever interrupting "Mommy...," after three hours of pie, I am usually totally exhausted and ready for bed myself. So, this time, I planned ahead. 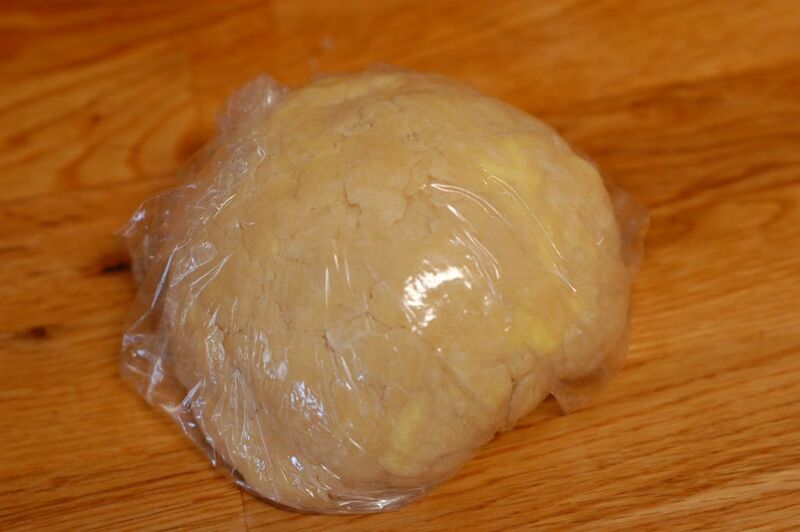 I prepared my pie dough early in the morning, wrapped it in Saran Wrap and put it back into the fridge to chill until I would roll it out that evening. This was also the first time my children have seen me prepare a pie. 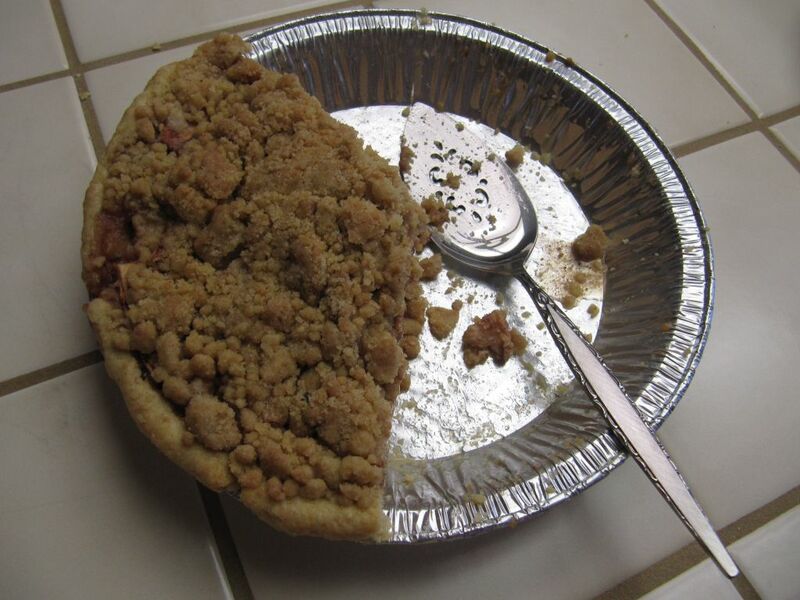 Typically, they wake up and Voila - the pie fairy has paid us a visit. As you can see, my four year old, Wilson, was fascinated by the yummy, sticky mess. 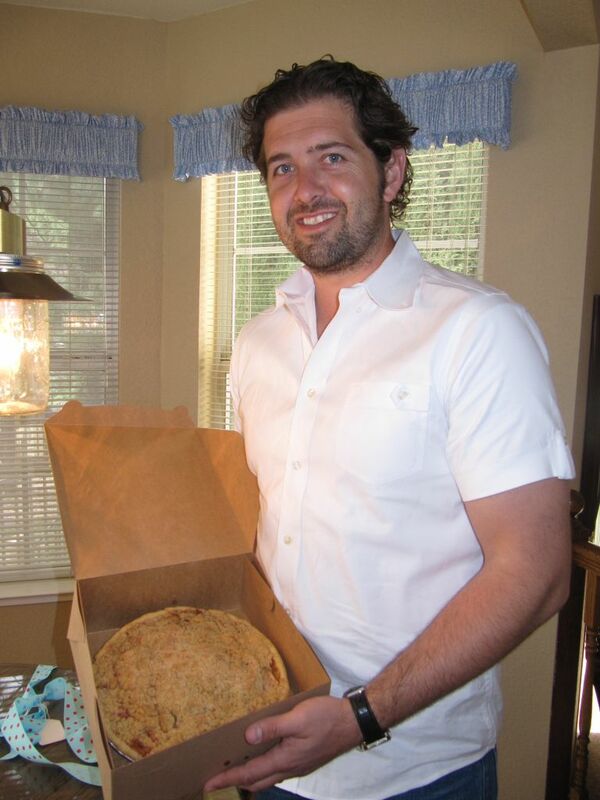 He is a regular "pie maker" in training. 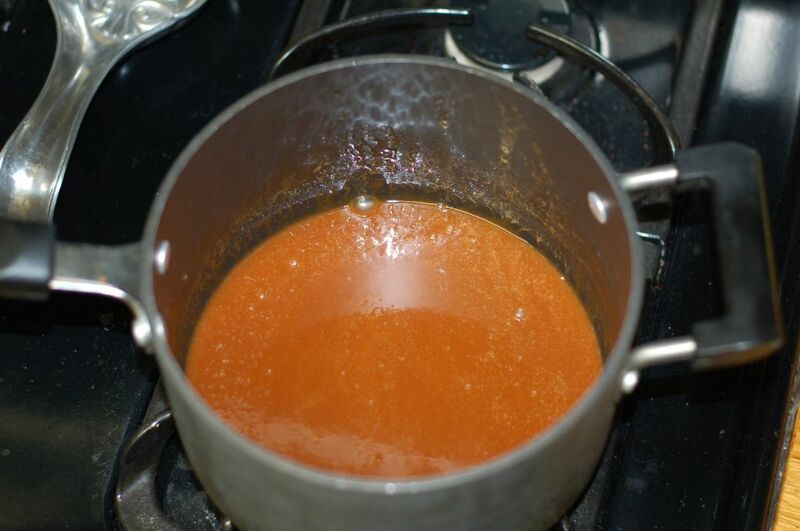 I also planned ahead by beginning my caramel sauce in the morning. Or, at least, I attempted to. Pinterest taught me to make caramel by placing an unopened can of condensed milk in the Crock-Pot on low for eight hours. So easy. Alas, this technique does not work with evaporated milk, which is what I mistakenly grabbed off the grocery store shelf amidst breaking up fights between my boys and trying to keep Henry from climbing out of the cart altogether. I did not realize the err of my ways until I opened the can at 8:30 pm and found unaltered evaporated milk. Not caramel. The insecure baker in me said, "See? I told you you couldn't do this. You clearly don't know how to bake. You should just give up." But, my husband, who is usually wiser and less hard on me than my inner voice, said, "I never really did like that Crock-Pot caramel sauce anyway. I think this is a happy accident. Let's make caramel from scratch." Armed with an online tutorial, a cup of sugar, several tablespoons of butter and some heavy whipping cream, we somehow ended up with caramel. Not just any caramel mind you, but amazing, delicious caramel! Caramel you can't stop dipping your finger into. The addition of several tablespoons of red wine only heightened it's richness. Happy accident indeed! While the caramel cooled, I cored and thinly sliced several peeled Granny Smith apples before tossing them in a large bowl with flour and cinnamon. Then, I stacked layer after layer of apples and caramel sauce until the pie crust was overflowing. But, the pie was missing something. It seemed naked. It was calling for a streusel topping. Let's be honest, what dessert is not enhanced by a little extra sugar and butter? So, I mixed together flour, light brown sugar, granulated sugar, salt, cinnamon and nutmeg. 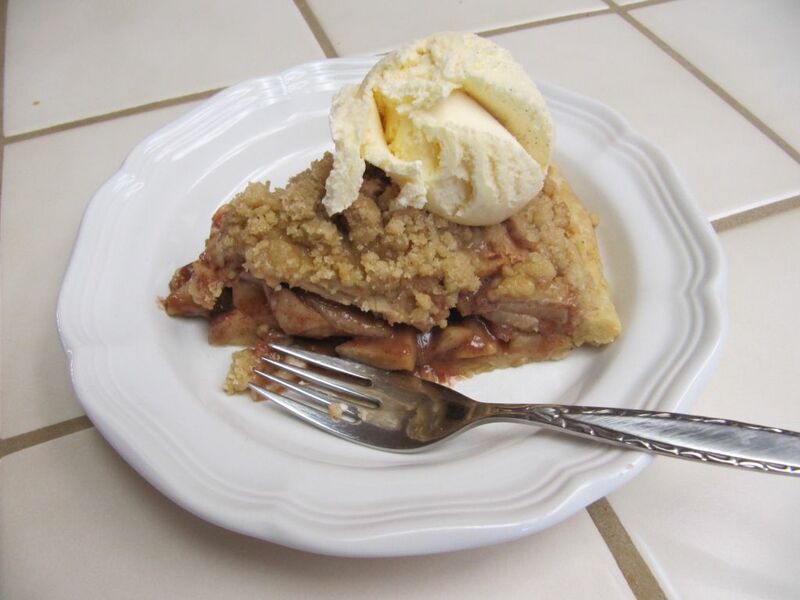 I drizzled in the melted butter, grabbed a fork and stirred until the crumble came together. 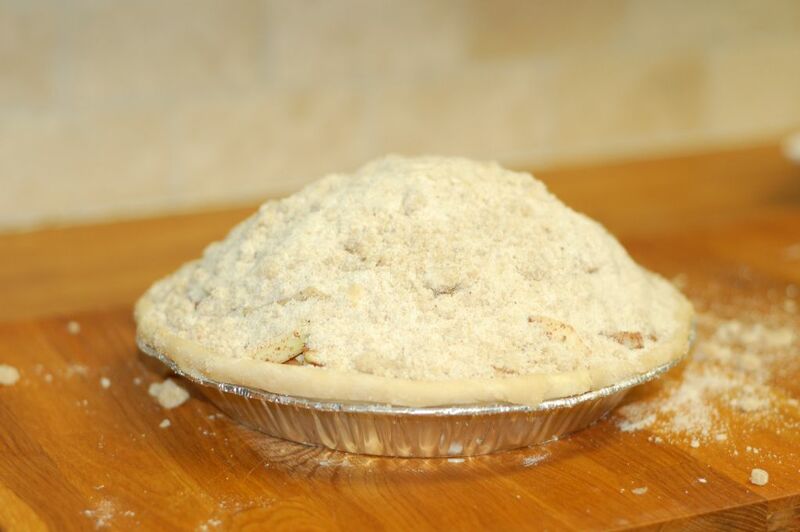 Then the whole pie was covered in a blanket of sugary crumbs. Much better. I baked the pie for the first half hour covered with foil to prevent the streusel from burning. Then, I removed the foil and baked it for another thirty minutes. And, again, that familiar smell of pie wafted throughout the house. Is there anything better? I have seen Brad grow from an enthusiastic 20-year-old, madly in love with my little sister, to a confident and successful businessman, husband, father and servant. I am honored to call him my brother. In a day in which a lot of people talk about doing, Brad does. All while making it look as easy as pie.